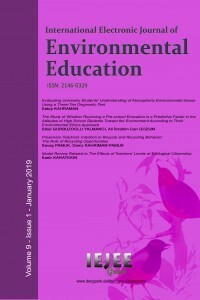 International Electronic Journal of Environmental Education is published two issues per year. IEJEE-Green provides immediate open access to its content on the principle that making research freely available to the public to support a greater global exchange of knowledge. IEJEE-Green is listed and indexed in: Environment Complete (EBSCO), Google Scholar, Index Copernicus, NewJour, Turk Egitim Indeksi, ASOS Index and ERIC.